As an alternative to a full basement/cellar waterproofing system (habitable conversion) a water control only system could be the answer, this is a process of simply controlling the ingress of ground water at the floor wall joint to prevent the water from spilling across the basement floor. The ingressed ground water can then be controlled into a pre-formed sump chamber containing a mains operated automatic submersible pump, which would evacuate the water to a suitable drainage outlet. This form of basic water control is used to address specific areas of water ingress at a lesser cost than that of a full conversion system. Where these systems are required, we endeavour to design them with the future in mind in that should greater use of the space be required then the installed system becomes an integral part of the upgrade. 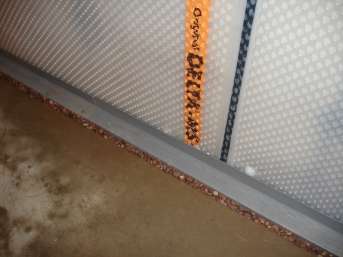 Invariably, a basement water control only system is used for non habitable use, which it would remain so following this type of installation, despite management of the water ingress, a full conversion would need to take into account compliance with Part L Conservation of Fuel and Power within the building regulations, thus insulation would be required within the basement walls and floor construction. Furthermore, compliance with BS8102 is preferred for a full structural waterproofing system.